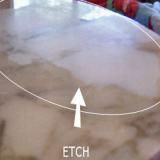 Polish marble like the pros with the incredibly easy to use marble polishing powder! This magical powder eradicates dull marks, water rings and etches without using power tools. A little wrist action is all that's needed! Use it on travertine, marble, limestone. Use it on polished stone surfaces. This one works on vertical and horizontal surfaces including countertops, back splashes, vanities, showers, fireplaces and floors. Bring The Shine & Luster Back to Your Marble Surface! Accidentally spill a little orange juice? The polishing powder works on countertops AS WELL AS floors! 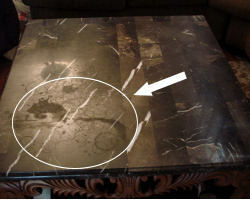 Did a little vinegar leak and leave behind a very visible dull spot on your marble top? 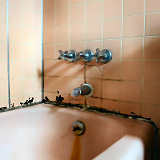 Unknowingly try a commercial bathroom cleaning product only to see a bunch of dull marks once the product was rinsed away? Or maybe you still see that horrible round glass shaped ring and it is DEFINITELY not going away on its own. "My bathroom travertine counter top went from being an eyesore and irritant, to pure joy, and it was so easy. All the dull areas have disappeared and the whole top has a wonderful, clean sheen. 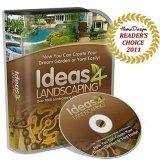 I love it!From being an eyesore and irritant, to pure joy, and it was so easy. Remove etch marks, ghost rings, dull marks and slight to medium areas of surface damage using this home owner friendly marble polishing powder. This product DOES what it is advertised to do! 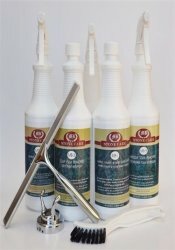 It REMOVES slight to medium marks of corrosion from polished calcite based stones. Your stone becomes shiny and new looking. Try the marble polishing powder for exceptional results.